The McDermitt caldera center ("McDermitt") is a polygenetic mid-Miocene volcanic center along the border of northern Nevada and southern Oregon, USA, and is one of the first silicic centers associated with the Yellowstone hotspot. McDermitt was active during the main stage of the voluminous Columbia River Basalt Group eruptions, and Steens Basalt forms the base of the Miocene volcanic section. Magmatism climaxed with the caldera-forming eruption of the ~ 400 km3 compositionally variable McDermitt Tuff at 16.35 ± 0.03 Ma. 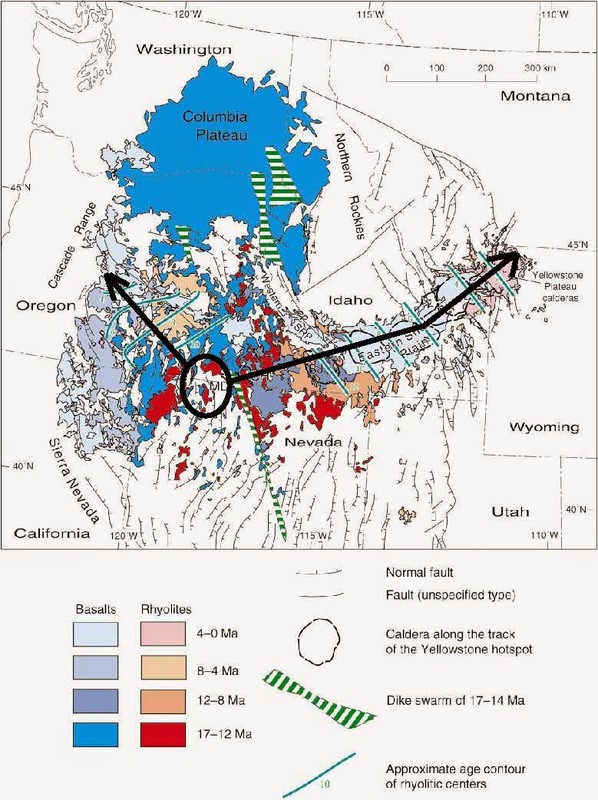 Geologic mapping of the western caldera margin has revealed much information on the evolution of the McDermitt caldera center and insight to the mechanics of the caldera-forming eruption. Geochemical investigations of the mafic volcanics at McDermitt reveals important links between local mafic magmas and the Steens Basalts, and thus to the Columbia River Basalts. A small group of compositionally distinct basalts at McDermitt have the most oceanic chemical signatures yet found among basalts of the Yellowstone hotpsot, which bears on the plume versus non-plume argument for the Yellowstone hotspot. Petrologic investigations and modeling of the silicic magmas reveal AFC process as the dominant magma evolution mechanism for the rhyolites at McDermitt, but some deviations exist (e.g., abundant assimilation, partial melting of cumulates crystallized from the magma). The results of this study are consistent with a model where Steens source magmas underplated Cretaceous intrusions as a result of mantle upwelling from the Yellowstone hotspot. These mafic magmas assimilated the country rock, and coupled with fractionation, evolved to a suite of intermediate magmas. The intermediate magmas subsequently evolved, through AFC and other evolutionary pathways, to form the rhyolites at McDermitt.